Visit several of Dominica's best beaches, with transportation included, during this 8-hour day trip. 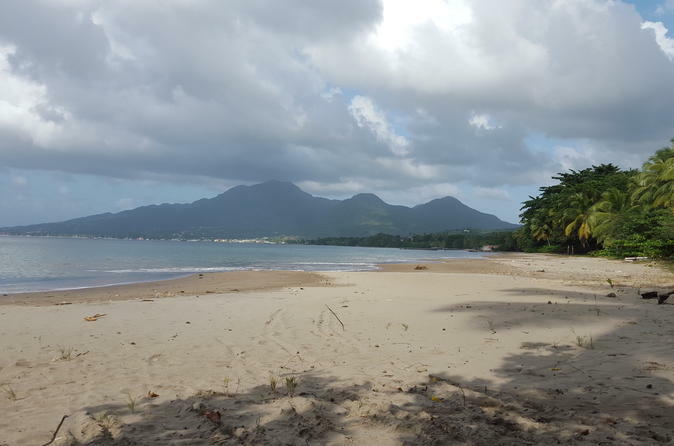 Leave the driving and navigation to an expert and focus on relaxing at stops such as Batibou Bay, Mero Beach, Point Michel, Champagne Beach, and Scotts Head. Make stops to purchase food and refreshments in island villages. Begin your beach day with convenient 10am pickup at your Dominica hotel, where you'll climb into an air-conditioned tour vehicle and enjoy the scenery on the way to your first stop. On the south side of the island, stop in the fishing village of Scotts Head, located between the Caribbean Sea and the Atlantic Ocean. Your next stop is Point Michel's Champagne Beach, so-named for the tiny bubbles that float in the sea due to volcanic activity in the sea bed. You'll see the tour's first black sand beach at Mero Beach, then head to Purple Turtle Beach to see some sea turtles. On the east coast, stop at Woodford Hill and Batibou Bay. The day's last stop is Calibishie, where you can refuel with drinks and food while enjoying sea views. Wind up your full day of beach hopping with hotel drop-off.